Bruised ribs may be an uncommon injury to sustain, but when it happens, it can be very painful. The ribcage consists of twelve pairs of ribs, with tendons and muscles in between. The typical way ribs get bruised is by something coming into strong contact with them; some kind of blunt force trauma. Kicks, intense falls, car accidents, or crushing them against something (such as playing a high-impact sport like hockey or football) are all common ways to bruise ribs, but on occasion the injury can even be caused by excessive coughing. Symptoms of bruised ribs include sharp pains under the rib cage and a feeling of only being able to take in short breaths. Since they can’t be compressed into a cast like other broken bones, the only course of treatment for bruised ribs is to let nature do its thing and ride it out for three to six weeks—while taking measures to not aggravate the injury any further. Determining if you have bruised ribs isn’t that difficult once you know what to look for. The first indication of bruised ribs is pain in your torso. 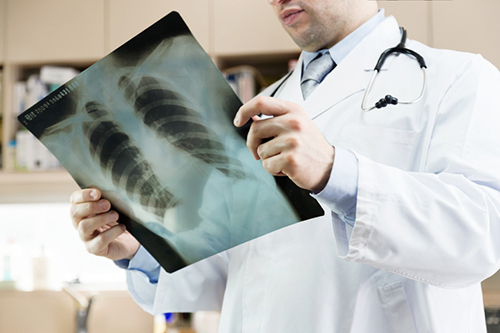 Rib injuries can also lead to complications; lung infections and pneumonia are two possibilities to watch for if a rib injury is suspected. If you think the rib might in fact be broken instead of bruised, it’s best to seek medical attention as soon as possible. Icing: As with most injuries, the first course of treatment is to get some ice, since icing is known to help ease pain and swelling. If you don’t have an ice pack, wrap something frozen in a tea towel and apply it to the bruised area; a bag of frozen peas works just as well. Continue to ice on and off every few hours for 72 hours or until a reduction in swelling and pain is apparent. Reduce the pain: The next step is to reduce the pain, and taking some kind of pain relief medication will help. Over-the-counter ibuprofen is a good choice, as is acetaminophen if you can’t handle “Ibuprofen”. If the pain is stronger than what these drugs can fight against, visit your doctor and they will possibly prescribe something a bit stronger to help you manage the pain. Deep breathing: Another step is to practice deep breathing. Breathing deeply allows the lungs to expand, which will help the healing process. Walk around as much as you can; this will help keep the lungs clear of mucus. And don’t try to avoid coughing, even if it hurts. Coughing is the body’s way of clearing your lungs; if mucus and fluid build up, the chances of getting an infection or pneumonia are increased and you’ll only make yourself feel worse. Protect the area: Protect the area from further harm as much as possible. It might feel silly at first, but walk around with an arm protectively shielding your rib cage. The last thing you want is to further aggravate the injury by bumping it, not to mention it will cause the pain to return! Resting and avoiding physical activity are very important during the healing period, which typically lasts from three to six weeks. Avoid lifting heavy objects: While healing, avoid lifting, pushing, or pulling any objects. This will only add further strain and do more damage. If the work you do involves any of these activities, consider taking a leave so you can rest properly and not put yourself in any situation that can cause further harm to the bruised ribs. Get the proper nutrients: Eating foods packed with vitamins, nutrients, and minerals will speed up recovery. The body needs those elements to repair the damage. As well, consider increasing the amount of fiber consumed during this time because of the reduced levels of activity. Fiber-rich foods include apples, pears, raspberries, lentils, whole grains, cruciferous vegetables like broccoli and cauliflower, and green peas. If after a few days you aren’t sure if the various bruised ribs treatments you’re applying are working, and you suspect or are concerned they might in fact be broken, see your doctor as soon as possible to get a conformation. Broken ribs are much a more serious condition, as there is the potential for a sharp bone fragment to puncture your lung. “Broken or Bruised Ribs,” National Health Service web site; http://www.nhs.uk/conditions/rib-injuries/Pages/Introduction.aspx, last accessed February 4, 2016. “Bruised Ribs,” Fastmed web site; http://www.fastmed.com/health-resources/related-searches/bruised-ribs, last accessed February 5, 2016. “Bruised Ribs,” MD Health web site; http://www.md-health.com/Bruised-Ribs.html, last accessed February 5, 2016. “How to Treat Bruised Ribs,” Lethow web site; http://lethow.com/health/treat-bruised-ribs/, last accessed February 5, 2016. “How to Relieve the Pain of Bruised Ribs,” Livestrong web site;http://www.livestrong.com/article/357074-how-to-relieve-the-pain-of-bruised-ribs/, last accessed February 5, 2016.